A fluffernutter is a sandwich that is filled with peanut butter and marshmallow fluff or marshmallow cream. The combination of sweet and salty works extremely well, making this gooey sandwich a favorite of just about any kid who has even had one. It’s the kind of thing that I don’t necessarily eat on a regular basis as an adult, but I still can’t resist the combination when it comes up and get a craving for it every now and then. 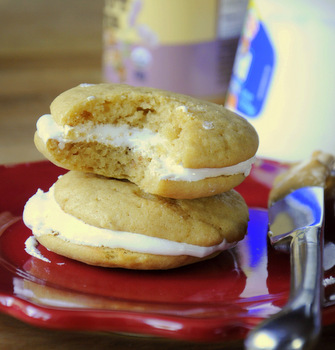 These Fluffernutter Whoopie Pies are inspired by this delicious sandwich. 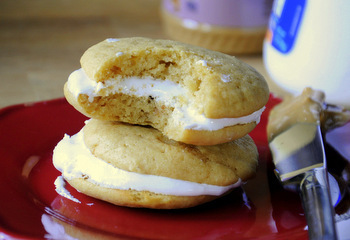 The whoopie pies have cake-like rounds of peanut butter cookies as their foundation, and they are filled with a mixture of marshmallow cream and peanut butter. You get a great peanut butter flavor and the marshmallow adds just the right amount (which is to say, quite a bit) of sweetness to make the whoopie pie exactly what you would expect to get from a fluffernutter. The peanut butter cake/cookies are actually quite good on their own, and they stand up well to the filling. You can use smooth peanut butter, but I prefer to use crunchy so that there is a little bit more texture in these. Regular, national brand peanut butters work well for both the cake and the filling, since they tend to have a good salty-sweet balance. Natural peanut butters also work, but tend to get a little bit gooey in the filling since they have a softer texture, so you might want to pack a few extra napkins. The marshmallow fluff also gets a bit messy in the filling – although I tend to think that it is part of the fun of eating a fluffernutter! – so I recommend filling these just before you intend to serve them. The cookies will keep very well when stored in an airtight container, so you can even make those a day or two in advance and fill them at the last minute. In a large bowl, cream together butter and sugars until light. Beat in eggs, followed by peanut butter. Blend half of the dry ingredients into the peanut butter mixture, followed by the buttermilk and vanilla. Blend in remaining dry ingredients until no streaks of flour remain and batter is well-combined. Batter will be more similar to cake batter than cookie dough. Drop batter in 2 tbsp rounds onto prepared baking sheet, allowing room for them to spread. Bake for 12-14 minutes, until the cookies are set and spring back when lightly pressed. 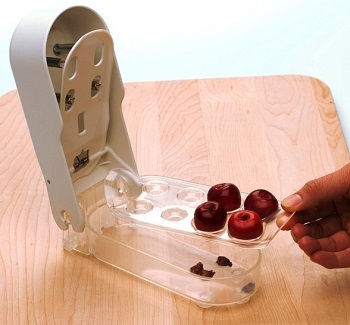 Transfer to a wire rack to cool completely before filling. To fill, pair cookies up. Spread one half of each cookie pair with a thin layer of peanut butter. Spread the other half generously with marshmallow fluff. Serve immediately. Great variation of the fluffernutter! Please send me the recipes on the back of the whoopee pie pan. When I took the wrapper off it ripped the recipes on the back.